The software feature includes multiple modes to combine Outlook PST items, which contains; Join multiple PST, Merge multiple PST and Merge contacts too. 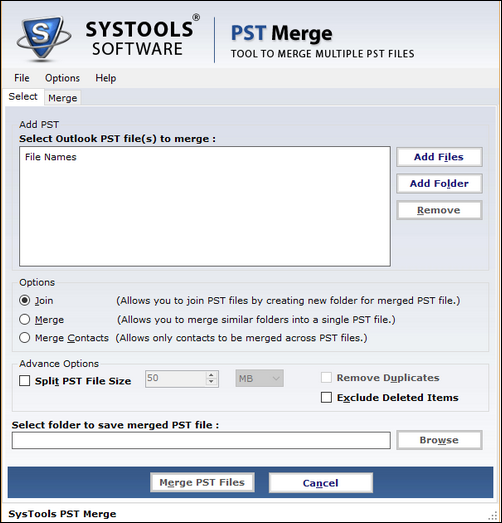 The users can either merge a common .pst file or folder by using Merge PST or can integrate one or more files under an individual folder within a common file using Join PST. With the help of PST Merge software, users can easily merge two or more Outlook Data files together. 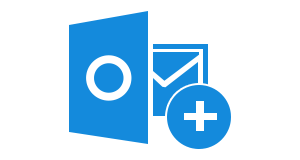 The application is designed to render the easiest and simple way of merging the data of a large number of .pst files into the common result for an easily manageable storage. 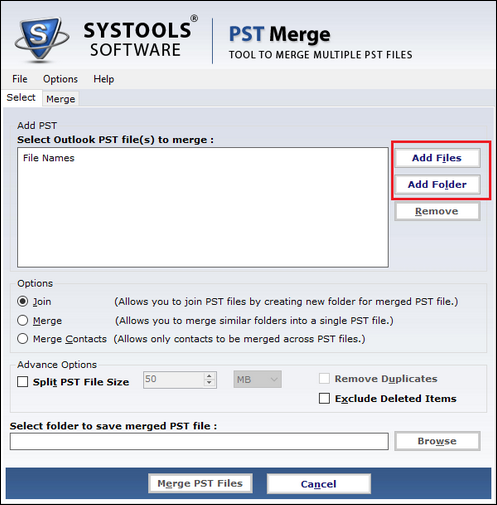 This particular option is provided for integrating the contacts only from different PST files into one by using PST Merge tool. This software offers ‘Contacts Only’ merge option instead of other two modes for specific requirements. Also, it keeps all the meta properties of the contacts altogether. PST merger permits the user to merge multiple PST data items together and remove all the duplicate files simultaneously; if required. Users just only need to mark/unmark on the Remove Duplicates Option, which enables or disables the removal of duplicates easily without any data loss. In order to integrate multiple Outlook data items together, users do not need to add each and every PST files one after another. 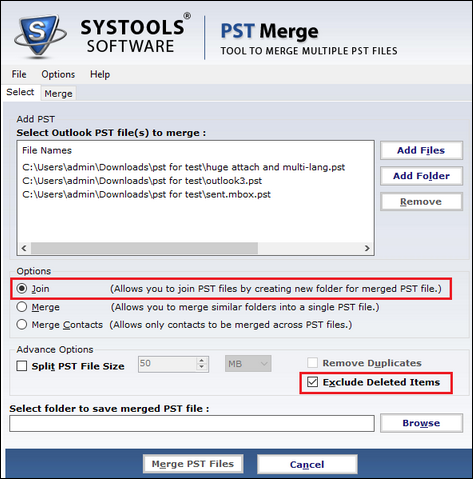 PST Merge software provides "Add folder" option to merge 2 or more PST data files at a time and do the merge Outlook folder process in batch form. Otherwise, if users want to add a single file at once then, selecting "Add files" option. When merging Outlook PST files users can further customize the overall process according to enhance the strategy of combining PST. Users can easily exclude either Duplicate data items or Deleted Items folder from being merged, or both while integrating Outlook PST data files. Once the merging process has been done, the software will create a complete status of merged PST file. It contains many components like number of PST files, name of PST file, duplicate files found, count total item and merge status. Also, it will display the name of integrated PST file, location of merged PST and also creates the duplicate.csv file format. There is no size limitation imposed on the quantity of data can be merged with PST Merge software. Users can also combine a large amount of PST files and the software performance will not be affected by the quantity. No limit on the file size or quantity of Outlook PST. Can I merge two or more PST files at once using PST Merge software? Yes, you can easily integrate any number of PST data files at a time. Even you can add file either individually or in bulk as per your choice. Does the MS Outlook installation required to merge multiple .pst data items? Yes, Of course, it is mandatory to have Microsoft installation on your computer system. Is the PST Merge software work with corrupted Outlook .pst files? No, the Pst Merge tool does not work if and only if the files are corrupted or even in inaccessible mode. Will the software remove duplicates while merging Outlook data files? Yes, only if you select the "Remove duplicates" option then, the software can easily remove the duplicates when merging multiple PST files. Does this tool compatible with Outlook 2013 email client? Yes, the PST file merge software is totally compatible with 2013 version of Outlook in both 32 nd 64 bit. After this, you can select any option out of these 3 options i.e, Join PST, Merge PST data and Merge Contacts. Also, you can mark on Exclude Deleted Items so that the unnecessary items should be removed. "Amongst all the software, luckily I found PST Merge the most suitable and reliable tool. I was probably the right decision. This utility made it really easy for me to get each and every data merged into a single PST file that too much of Unicode formatting which permits me to have built the larger storage. Thank you so much for creating an awesome tool. Great worK!!" "Outlook data files are strong saviors of data generated. The issue that I faced was in managing PST file from home machine and office as well. I merged both the Outlook PST files and the surprising fact is it worked well with zero percentage error. 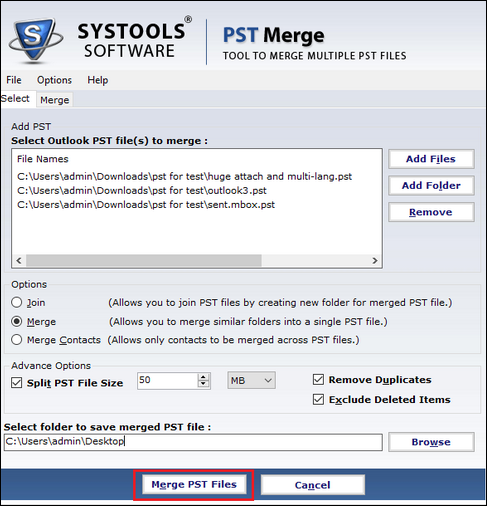 I recommend every Outlook users to get PST Merge tool. Best Tool and Attractive Features!! "